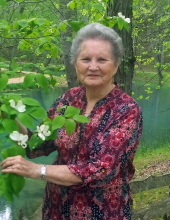 Doris Lee Marlow DeLoss, age 85 of Conroe, TX, passed away January 16, 2019. She was born on December 25, 1933 in Edgar Springs, MO. She served as a loving wife, mother and grandmother to her family. Doris was married to Jim DeLoss on October 23, 1954 until his passing to the Lord on October 9, 2013. They lived in St. Louis, MO then moved to Oklahoma City, OK in 1955 where they had three children. The family moved to Pasadena, TX in 1964 then to Conroe, TX in 1968. She was preceded in death by her husband Jim DeLoss, daughter-in-law Karen DeLoss; granddaughter Sara Elizabeth DeLoss, great grandson Cj Ely Gibbs, mother Lena Elizabeth Rogers; father James Enoch Marlow; sister Dena McElfresh and brothers Delbert Marlow and Donald Marlow. She is survived by sons Jimmy and wife Sharon, Rodney and wife Darla; daughter Tammy and husband David Sargent; grandchildren Cliff, Shawntel, Marlys, Eric, Jacob, George, Lucas, LaDawna, Stephanie, Megan, Tara, Sherene, Steven, Justin, Margie, and Patrick; thirty-five great grandchildren; six great great grandchildren; sisters Geri Williams and Ada Rose Torrez; and numerous nieces, nephews, cousins and many loving friends. A viewing is being held on January 21, 2019 from 6:00 p.m. to 8:00 p.m. at McNutt Funeral Home. Memorial services will be held at 2:00 p.m. on January 22, 2019 at McNutt Funeral Home with Dr. Ron Bates officiating. In lieu of usual flowers, contributions may be made to The Light Community Fellowship Church, Summer Camp, P.O. Box 2066, Willis, TX 77378 or MD Anderson Cancer Center. To send flowers or a remembrance gift to the family of DORIS L. DeLOSS, please visit our Tribute Store. "Email Address" would like to share the life celebration of DORIS L. DeLOSS. Click on the "link" to go to share a favorite memory or leave a condolence message for the family.